From the first handshake to the thank you when leaving our home,we were very happy and impressed with Nuvia’s customer service. Our rep’s service can’t be beaten.Super knowledgeable,super friendly, no “pushy/forceful” sale. Followed through with everything, I.E. products, deliver, calls and return calls. The quality of our water has completely changed. It has helped tremendously with our daughter’s eczema.No more hard water with bathing, showering or brushing teeth. The water feels like soap when washing hands or doing dishes. Nuvia was recommended to us by a close friend. When visiting her house, we experienced her water and had to also have it. Nuvia is great and we recommend it to all of our friends and family. “Our water was hard water and the shower heads and faucets had hard crusty deposits which was a concern for me. We chose Nuvia water because the we were buying filtered water by the bottle, which was expensive and time consuming, and Nuvia provided a wonderful affordable option. My wife and I chose Nuvia water because we wanted healthier water and wanted to ensure quality water for our family. We get so many compliments on the hand soap! P. S. And I personally love the way the bar soap smells and feels. The presentation was professional and provided enough information that made the buying decision easy. Since installation, the quality of our water has improved significantly. The rep even came back to test the water after installation! Working with Nuvia Water has been a great experience. Completely appreciate the professional and attentive service. We chose Nuvia Water because we wanted to know our water is the cleanest and healthiest it can possibly be for our family. Nuvia customer service is great and the representative answered all our questions. I chose Nuvia Water because they have excellent customer service and provide proof of water quality. Health is my number one concern, but in addition to better quality water, it has a much better taste too! Clean water is important to the health of my family. We chose Nuvia because it’s a good company with great service. They answered all of my questions and now our water is great! I saw a Nuvia advertisement and decided to call, and am so glad I did. The staff answered all of my questions and were very nice. I love the system and can see a huge difference in the quality of my water. We chose Nuvia for their quality. Cleaner water is very important to us because we have a son with lung disease and uses oxygen via cannula and through an humidifier. The water has made a huge difference by diminishing dry nose and congestion. I am a new home owner (new to us, but an old home) and had my water tested. It FAILED- ie, sediment galore! Clean water is important because it is the most ingested media into our body. Since Nuvia, our water is softer and tastes better. Nuvia’s service was excellent, friendly, courteous, and informative. We were looking for a better filter for health reason when we found Nuvia. They have provided good service and our water tastes much better. Your customer service was friendly and informative. Before Nuvia, our water quality was average to poor. With Nuvia, the water quality has improved and feel confident in the water my family uses. Cleaner water was a concern for us because we wanted to start taking better care of our health. Nuvia did a great job of presenting the facts of how water touches our lives and health in so many ways. Since installation we’ve noticed a big time change in our water—and the touch of our skin as well. Quality water is important to me and my family. I am a water drinker. It’s all I drink. Now our water tastes great and I love it. The shower is awesome, too. And Nuvia customer service is awesome! Clean water was important to us because it is healthier, safer, and better for plumbing. We liked Nuvia Water Technologies for the quality of the product, customer service, and price. 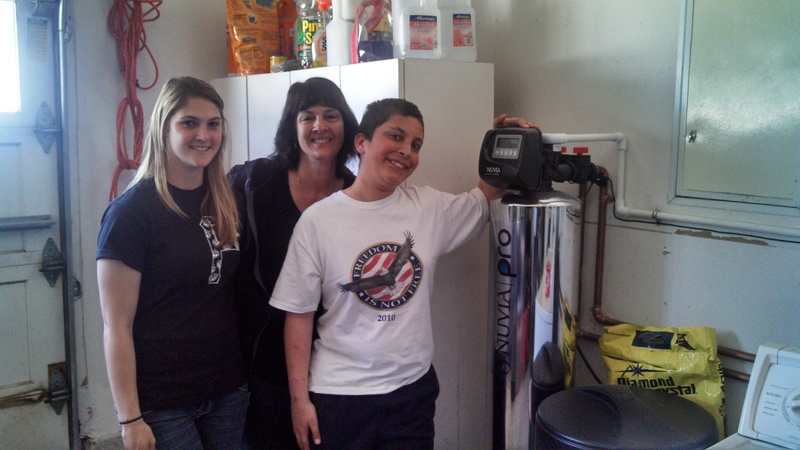 We bought our water filtration system to prevent future expenses related to health and plumbing. Since Nuvia, our water is much cleaner and softer. Customer service is great, and the reps are very helpful and informative. We were customers with another water company, but the rep closed the deal with his expertise and professionalism. Our rep was amazing. He was extremely knowledgeable, and what he did not know he found out immediately. Cleaner water is important to us for longevity, better health for ourselves ad kids, and pets. Tests confirmed the huge improvement in our water. Health was the number one reason we wanted better water. Since Nuvia installed a system, we’ve noticed a huge improvement in the taste of the water, the sparkle of the dishes, and the need for less products such as coffee and soaps. We’ve been most impressed with how the system was manufactured compared to other son the market. Nuvia employees know their stuff! I was impressed by their knowledge, professionalism, and excellent customer service. 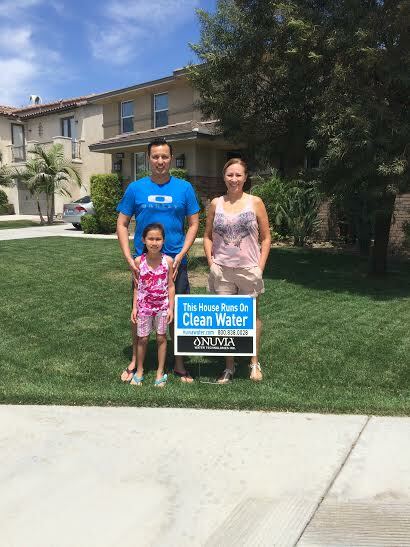 Nuvia Water understood my concerns about the health of my family and the value of cleaner water. We’ve noticed a huge difference in the taste and feel of our water since installation, and we could not be happier. I was interested in a water filtration system to prevent future expenses related to health and plumbing. I am happy to say that my water is much cleaner and softer now. Thank you Nuvia for great customer service! Nuvia customer service is fantastic! Everything went great! Everything was explained very well. In fact, it was incredible to see how gross our water was and how great it is now. Now our ice cubes are clear, the water tastes great, and our hair and skin is so much softer. The deal was too good to pass up, and so glad we didn’t! The customer service was straight forward and with a smile. 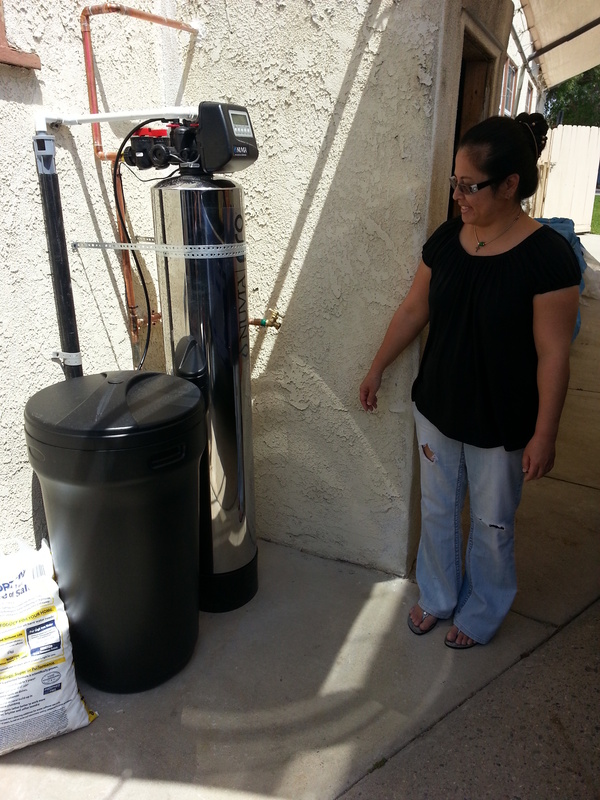 We wanted a system because we believe the old water was contributing to health issues. Now it tastes and smells great and we are feeling much better. We also have children with medical issues and knew that cleaner water would really be beneficial to them. Nuvia Water’s customer service was great. Both the sales rep and installer were knowledgeable, professional, and helpful. We chose Nuvia Water because we were impressed with how the system was manufactured compared to other systems on the market. Better health was our number one reason for wanting a water system, but as an added benefit our water tastes better, glasses sparkle, and we use so much less cleaning products! The folks at Nuvia Water Technologies were amazing. They were knowledgeable, and if they did not have the answer they found out immediately. 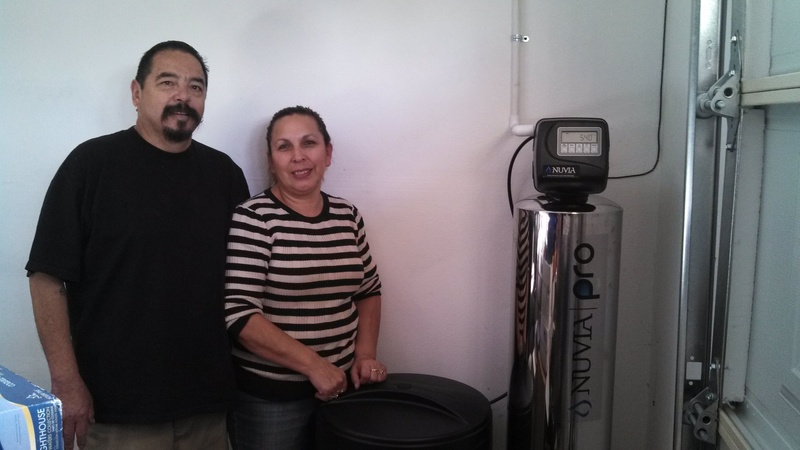 We wanted a water system because we work toward better health and longevity for ourselves, children, and pets. Originally, we were just curious about the quality of our water. Tests confirmed our suspicions, and the rep sealed the deal with his professionalism. Our Nuvia Water rep was very professional, knows the product well, and provided excellent customer service. I wanted a water filtration system because I care about the health of my family and clean water is at the top of my list. 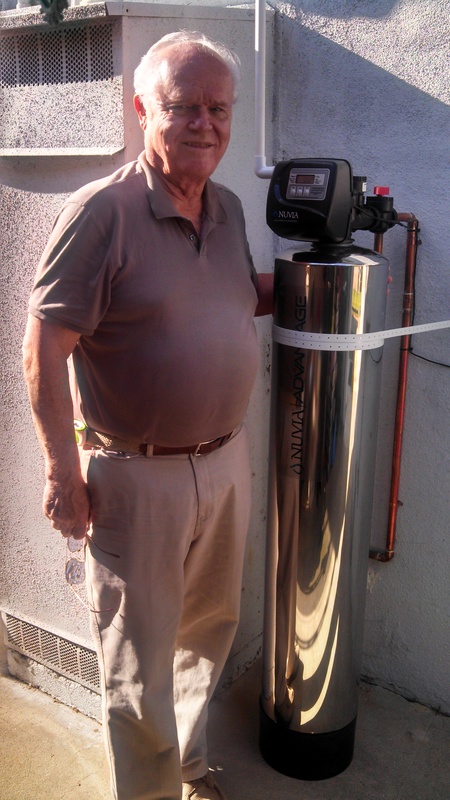 Since installation, we have noticed a huge difference in the quality of our water. After showering, I feel revived, refreshed, and renewed and definitely ready for the work day ahead of me. — J. Mims, M.D. Our rep was excellent and very knowledgeable. He had great people skills and answered all of my technical questions along with my wife’s cosmetic questions adequately and in a professional way. We chose Nuvia because clean water is important to our overall health and that of our future children. Since installation, the water feels and tastes great. We experienced a very noticeable improvement immediately and are very excited about our new system. I wanted a water system because I wanted healthy water for my kids. Now, I have healthy water that tastes and feels great. The water is softer and our clothes come out cleaner and brighter. Nuvia was my choice because of their professionalism, and I could not be happier! We were shocked to find that our old system (from another company) only solved the hard water problem but did not remove the harmful chemicals as we had thought. It was distressing to learn that we were using water filled with all of those chemical for over five years, so we were very pleased that Nuvia provided an excellent solution. Installation was speedy, and completed in under three hours. The rep was well-prepared and came with all the necessary tools. You could tell he was a real craftsman as he carried every tool and part he might ever need in his van. He was also very informative, and answered all of our questions in a polite and thorough manner. We noticed an immediate change in our water. The difference is especially noticeable on our skin. After showering, our skin feels incredible, soft and moist, even without lotion. For all of these reasons, we would recommend Nuvia to anyone! My name is Irma. Recently my fiancé and I purchased our first home. As a child I suffered very dry skin. My mother was told I had eczema. I went through life using prescription medications. Now, as a mother of 4, I was told by my child’s physician that he too has the same skin problem. My son has very dry skin, cracky and scaly. Well, I should say — HAD. My fiancé noticed very hard water in our new home and he actually had a rash appear on both sides of his body. He said, “that’s it, we need to do something”! That very same day I received a card stating to please call. I did, and to my surprise, it was NUVIA. I agreed to hear more and that’s when I was sent Bret. 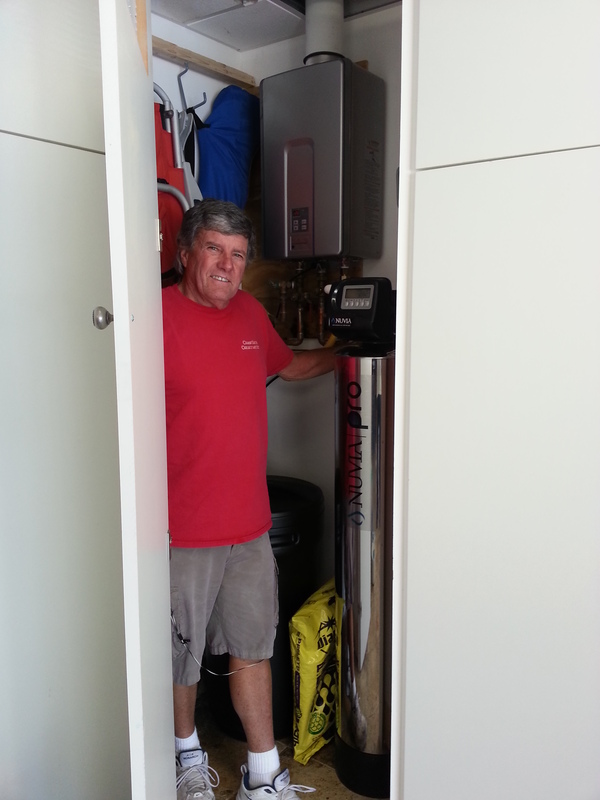 Bret showed up at our convenience, very professional, courteous and knowledgeable. Did I mention that I come from a water quality profession background? Working in the water utility industry, I’ve visited our treatment and recycling plants and am very aware of what goes into our drinking and potable water. 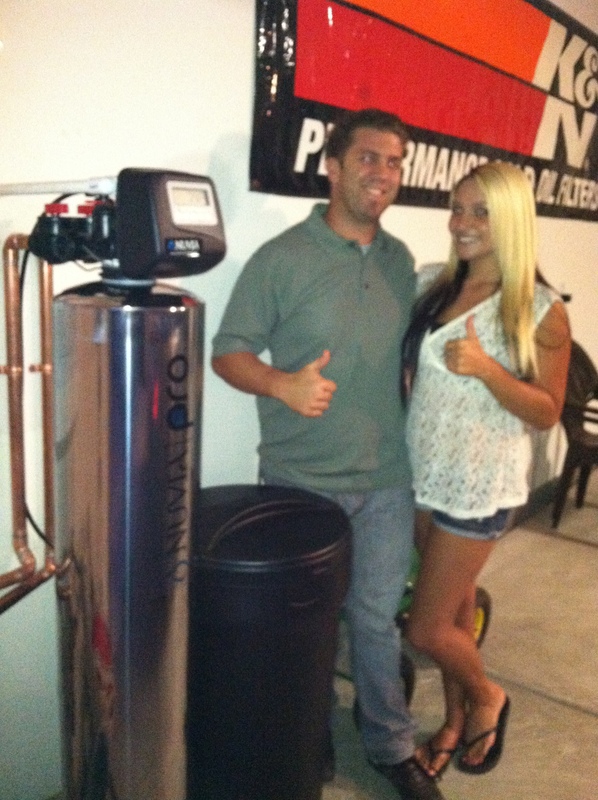 My fiancé (Julian) and I totally agreed on all the benefits that clean alkaline water would be for our family. We could not let Bret leave without giving us our cleaning system. Day 1 – I bathed my two boys in the NUVIA system water and we all showered that night. Day 2 – My son woke up with soft skin, no itching, no scaly/ashy skin. Julian also smiled and said his rash was very minimal. Day 3 – My sons skin almost completely healed, no signs of redness or other problems. Julians rash healed. I too have noticed smoother/softer skin. Hair conditioner is no longer used/needed. (That was amazing). Shower stall is no longer dull with hard water build up. 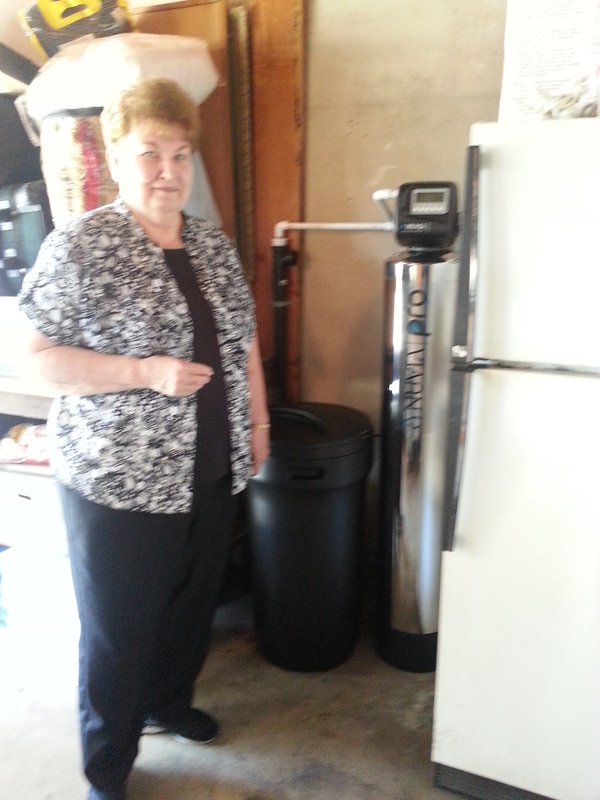 I cannot say how much this new alkaline water softener was needed and appreciated. I truly believe in alkaline foods we put into our bodies to ward off and prevent diseases and now I am able to enjoy my own alkaline water in my home. I truly believe Bret was Heaven sent. Irma & Julian, Pomona, CA. 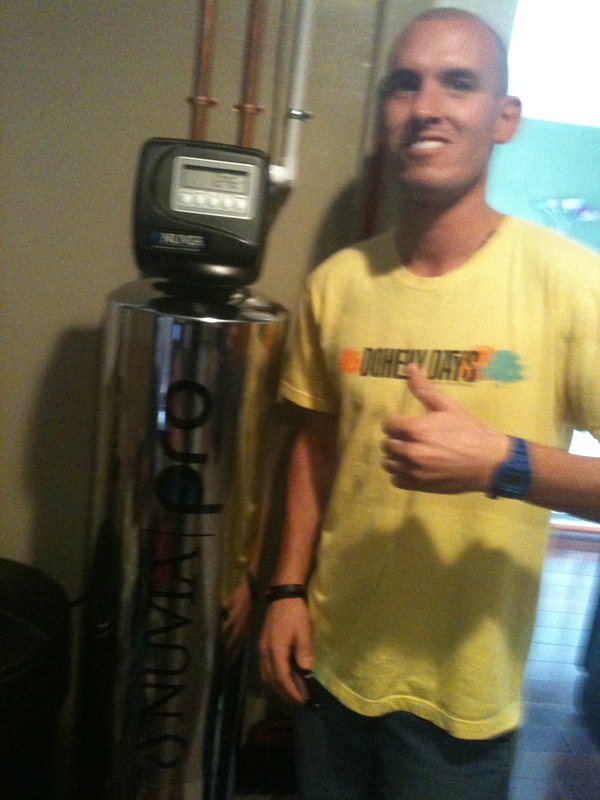 NUVIA WATER customer K. Webb with his new system. 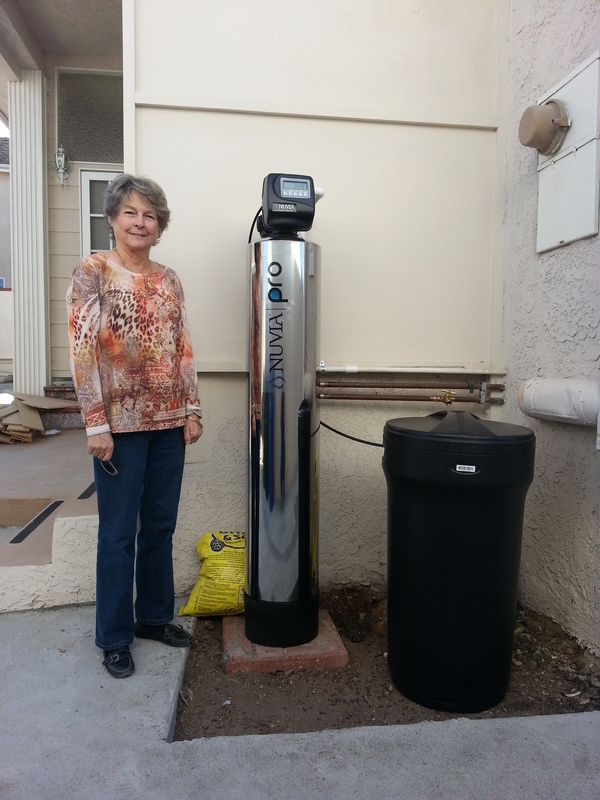 We are very happy with our Nuvia water system, we got the whole package! Our water is finally safe, coming right out of the tap… amazing, I know. We feel safe using it to make bottles for our 6 month old grandson and our daughter’s skin condition which by the way is supposed to be with her for life is pretty much resolved so far and we have only had or system for a little over a month. We drink it, we cook with it, we love it! Our sales rep Matt did a great job of presenting this product and will be getting plenty of referrals from us. We highly recommend Nuvia to anyone who cares about what goes in and on their bodies! Cleaner clothes, softer skin and most of all, safe to drink water, what else can anyone ask for? The easy financing was a major plus for us as a family of 8. Get this product, you own it for life! If you move, it moves with you. The money we save on all the other products that we were using in bulk is paying for this system… Thank you Nuvia for a healthier family! Ps. Loving the softer skin and hair!! !